Canticle, the follow-up to Ken Scholes’ Lamentation, shares some of the same flaws and strengths as the first novel, including a rough start, but like its predecessor overcomes its flaws to turn into an engrossing, if not action-packed, novel. Canticle picks up a few months after the events of Lamentation. 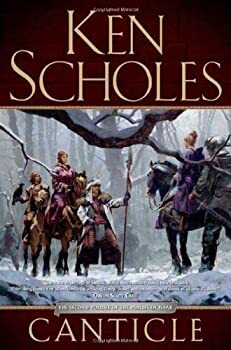 It’s Scholes’ concerted effort to recap those events that makes the opening somewhat flawed, as much of the exposition feels forced and awkwardly inserted. I think he would have been better served with a simple prologue recap, rather than filtering the events through the conveniently-placed reminiscences of his characters. Luckily, the clumsiness only lasts for a few dozen pages before Scholes deems us sufficiently caught up and lets us move into the new plot. And there is a lot of plot here to get to. Similar to Lamentation, which opened with the destruction of the entire city of Windwir and its priceless storehouse of old knowledge, Canticle starts with a bang when a celebratory feast hosted by Rudolfo, the Gypsy King, is attacked by a wave of assassins magicked into invisibility by old, forbidden “blood magics.” At the same time, Rudolfo’s wife Jin Li Tam is in labor with their firstborn child. In short order (and I mean short), several rulers are dead (though Rudolfo has been purposely and mysteriously spared). Jin Li gives birth to a sickly, apt-to-die son. The former Pope Petronus is attacked. The hidden girl-queen of the Marshers — Winter — is forced to come out from her concealing shadow and declare herself Neb, the Marshers’ prophesied homefinder, becomes part of an expedition chasing a rogue mechanical man into the Churning Wastes in hopes it will lead them to a second Great Library. Vlad Li Tam — Jin Li’s father and architect of much of what happened in Lamentation — is made captive. Civil war threatens to rage across the Named Lands. And an ancient and up-to-now unknown prophecy rises, built around the long-dead Wizard Kings responsible for the Churning Wastes. Continuing the style and structure begun in Lamentation, the point-of-view shifts quickly among a raft of characters, with most chapters being only a few pages long. The sheer amount of plot plus the quick point-of view and chapter shifts combine to create a fast-moving read. The plot tends to focus on political machinations; like Lamentation, this is not a book filled with battles or swordplay (though it has a few small fights). This isn’t a complaint, merely an acknowledgement. Those who like epic warfare or small bands of stalwart underdogs fighting their way through armies should look elsewhere. Personally, I liked the focus on schemes, politics, and characters, the strange alliances and sudden betrayals. The subplot involving Jin’s father Vlad is especially tense and gripping, while the story of Winter’s ascension to queen has much the same potential though it isn’t mined quite as intensely or richly. At times Canticle shares with its predecessor the problem that the quick shifts sometimes rob us of some depth of characterization, not allowing us the time we’d like to spend with any single character or in any single scene. Vlad is the most compelling character, due to his sharp, long-range thinking and probing; his personal moral complexities; and the intensely emotional situations he’s placed in. Jin, one of the stronger characters in Lamentation, unfortunately isn’t as interesting here, her dual roles of new mother and new queen feeling a bit perfunctorily acted out. Petronus, Isaak the mechanical, and Neb also feel a bit washed out in comparison to their roles in Lamentation, but this is offset by the emergence of Winter into a strong character and the introduction of several new and intriguing characters. World-building remains a bit thin, both in terms of a full sense of place and politics and vivid setting, though the unveiling of the Churning Waste opens up a bit more of the world and its history. And there were times I thought Scholes could pull back a bit from the internal monologue, the filtering of emotion or motivation through the characters’ interior thoughts, such as the effect of becoming parents on Rudolfo and Jin, or Winter’s anxiety. Several of the plots come to resolution by the end, others remain hanging, and still new ones are raised in the last few chapters. The Psalms of Isaak series as a whole has a good sense of rising intensity, as villains lie behind villains and the crises move from small-scale to epic clashes. Complex, frightening change looms in the air. While most of it seems ominous, some of it is also less sinister in the reader’s eyes, such as the burgeoning movement toward democracy rather than autocracy in some of the regions. And without knowing the full history of this world, the reader doesn’t yet feel fully comfortable in pigeonholing the proponents of such change. This is a bit more sophisticated than “Dark Lord bad: Status Quo good.” Lamentation was a strong opening despite its flaws and Canticle similarly more than compensates for its own faults while also side-stepping the usual problems with a series’ bridge book. Recommended. PLOT SUMMARY: It is several months after the events of Lamentation. At the Keeper’s Gate, which guards the Named Lands from the Churning Wastes, a strange mechanical figure appears, with a message for Petronus, the Hidden Pope. Vlad Li Tam, who has fled into the Scattered Isles with his entire family — all save Jin Li Tam — is also trying to solve this Whymer Maze and seeks the source of the threat that frightened the Androfrancines so much that they were willing to bring back Xhum Y’Zir’s Seven Cacophonic Deaths. Meanwhile, many noble allies have come to the Ninefold Forest for a feast in honor of General Rudolfo’s firstborn child. Jin Li Tam, his wife and mother of his heir, lies in childbed. On this Firstborn Feast night, several acts of unmitigated violence are sprung, setting into motion events that will change the Named Lands forever. CLASSIFICATION: Despite featuring robots and other science fiction elements, the The Psalms Of Isaak are mostly character and plot-driven epic fantasies that in terms of tone, style, and prose strongly reminded me of Daniel Abraham’s THE LONG PRICE QUARTET. The books have also evoked Lian Hearn, Daniel Fox and Elizabeth Haydon, and are recommended to readers who like their fantasy fast-paced, mystical and emotional. FORMAT/INFO: Page count is 384 pages divided over twenty-six chapters, a Prelude and a Postlude. Also includes a map of the Named Lands. Narration is in the third-person via returning protagonists Rudolfo, Jin Li Tam, Petronus, Neb and Jin’s father Vlad Li Tam, with each viewpoint marked by the character’s name. New viewpoints include Winters the Marsh Queen, General Lysias who previously served under the Overseer Sethbert, and Rae Li Tam, another of Vlad’s many daughters. Canticle is the second volume in the five-part The Psalms Of Isaak saga, and like its predecessor, is somewhat self-contained with a definite beginning, middle and end, although it also serves as a bridge novel to overarching events. The third volume, Antiphon, will see publication sometime in 2010. October 13, 2009 marks the North American Hardcover publication of Canticle via Tor. Cover art once again provided by Greg Manchess. ANALYSIS: Ken Scholes’ debut novel, Lamentation, really impressed me, although I felt the book suffered from a number of problems. Some of those same issues, like minimalist world-building (a glossary or refresher of certain topics would have helped immensely, i.e. House Y’Zir), an unimaginative magic system (powders, dreams, prophecies) and underdeveloped subplots (Vlad Li Tam’s betrayer) are still present in Canticle, the second volume in The Psalms Of Isaak, but as a whole the new book is a much stronger effort. The reasons why Canticle is stronger than its predecessor are simple and twofold. The first is that Ken Scholes is just a much better writer the second time around. In Lamentation, it felt like he was trying to figure out how to write a long form novel as he went, while also juggling characters, plot and world-building. As a result, Lamentation was a bumpy reading experience. Reading Canticle on the other hand was like cruising in a Mercedes Benz or a Lexus. The flow of the novel was much smoother and more engaging, the author’s command of the story and its many branching subplots was executed with greater effect, and the prose was once again elegant bordering on poetic. In short, the progress made in Ken Scholes‘ writing between the two novels is simply amazing and a large factor in why I enjoyed Canticle so much more than his debut. The other reason is that there’s just so much more happening in the sequel. Basically, Canticle is a bridge novel that picks up several months after Lamentation, which served as the foundation of the series. With much of the setup already established in the debut, Ken Scholes was able to jump right into the action at the beginning of Canticle and kept the pedal floored all the way through the Postlude: Rudolfo and Jin Li Tam’s baby who is born sick and dying. A betrayer among House Li Tam. Assassins using the forbidden — and what was thought — forgotten blood magick which is five times as potent as earth magick. Winteria bat Mardic (Winters) announcing herself as the Queen of the Marsh. Petronus and Vlad Li Tam facing their reckonings. Civil wars and political machinations among the Entrolusian City-States, Pylos and Turam. A journey into the Churning Wastes in search of Sanctorum Lux, or what is believed to be a complete copy of the Great Library that was destroyed in the Desolation of Windwir. The Great Mother, Child of Promise and Home. A Y’Zirite resurgence. These and many other subplots make up the story of Canticle, which is jampacked from start to finish with one amazing mystery or revelation after the other. Seriously, nearly every single character section — which on average is only 3-4 pages long — unveils some new intrigue or shock, and after a while I began to doubt whether the author could keep it up for the whole book, but he does, saving the best surprises for the end. And it shall come to pass at the end of days that a wind of blood shall rise for cleansing and cold iron blades shall rise for pruning. Thus shall the sins of P’Andro Whym be visited upon his children. Thus shall the Throne of the Crimson Empress be established. But the events of recent weeks had shown him that life was a nonmetrical song at times, one that went where it needed to for the melody without respect for the rhythm of history and tradition. Truly a canticle that one danced to as best one could. You would think that the characterization would suffer in Canticle, with so much happening plot-wise, the constantly switching viewpoints, and the short amount of time dedicated to each section — but that’s not the case. Instead, Ken’s characters are one of the book’s greatest strengths, which goes back to the author’s improvement between novels. In other words, Ken Scholes has learned to maximize the time spent with each character, constructing characters that are not only well developed and interesting, but also resonate with the reader on a higher level emotionally compared to Lamentation, especially if you’re a parent, in love, or plagued by guilt. Of the already established viewpoints, I was most moved by Vlad Li Tam’s plight and the dilemmas faced by Rudolfo and Jin Li Tam in regards to their newborn child, while I found Winters’ narrative the most compelling of the new perspectives. In truth though, every single point-of-view in the book is compelling in its own way, even if Rae Li Tam’s seemed a bit pointless. Negatively, apart from the issues I mentioned above, I was annoyed by the number of times that Jin Li Tam was described as “formidable.” Of course, this is more of a personal complaint than an actual problem with the book. CONCLUSION: After finishing Lamentation I felt the book was a good, but flawed debut written by an author with a lot of promise. A novel on the same level as other second/third-tier debuts by the likes of Daniel Abraham, Brandon Sanderson, Robert V.S. Redick, etc. After finishing Canticle however, I feel that Ken Scholes has already made the leap from good to great, and I’m super-excited by the potential that the rest of The Psalms Of Isaak has to offer. In short, if you thought Lamentation was impressive, then just wait until you get a hold of Canticle. ROBERT THOMPSON (on FanLit's staff July 2009 — October 2011) is the creator and former editor of Fantasy Book Critic, a website dedicated to the promotion of speculative fiction. Before FBC, he worked in the music industry editing Kings of A&R and as an A&R scout for Warner Bros. Besides reading and music, Robert also loves video games, football, and art. He lives in the state of Washington with his wife Annie and their children Zane and Kayla. Robert retired from FanLit in October 2011 after more than 2 years of service. He doesn't do much reviewing anymore, but he still does a little work for us behind the scenes.